The Solution below shows the D minor scale 7th chords, (i7, iiø7, III7, iv7, v7, VI7, VII7) on a piano, with mp3 and midi audio. This step shows the tonic 7th chord of the D minor scale. 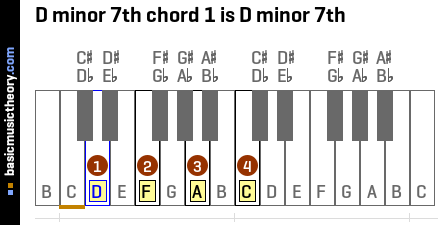 The D minor chord i7 is the D min 7 chord, and contains the notes D, F, A, and C.
This tonic 7th chords root / starting note is the 1st note (or scale degree) of the D natural minor scale. This step shows the supertonic 7th chord of the D minor scale. 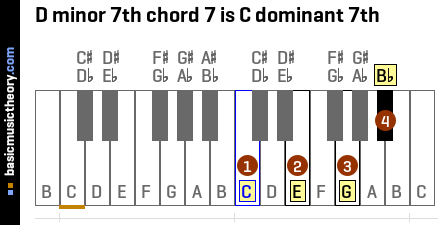 The D minor chord iiø7 is the E half-dim7 chord, and contains the notes E, G, Bb, and D.
This supertonic 7th chords root / starting note is the 2nd note (or scale degree) of the D natural minor scale. This step shows the mediant 7th chord of the D minor scale. 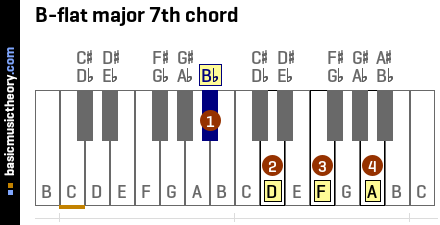 The D minor chord III7 is the F maj 7 chord, and contains the notes F, A, C, and E.
This mediant 7th chords root / starting note is the 3rd note (or scale degree) of the D natural minor scale. This step shows the subdominant 7th chord of the D minor scale. 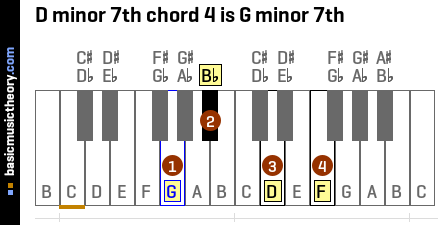 The D minor chord iv7 is the G min 7 chord, and contains the notes G, Bb, D, and F.
This subdominant 7th chords root / starting note is the 4th note (or scale degree) of the D natural minor scale. This step shows the dominant 7th chord of the D minor scale. 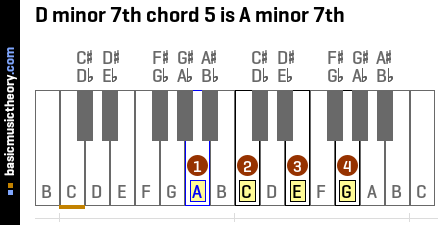 The D minor chord v7 is the A min 7 chord, and contains the notes A, C, E, and G.
This dominant 7th chords root / starting note is the 5th note (or scale degree) of the D natural minor scale. This step shows the submediant 7th chord of the D minor scale. The D minor chord VI7 is the Bb maj 7 chord, and contains the notes Bb, D, F, and A. This submediant 7th chords root / starting note is the 6th note (or scale degree) of the D natural minor scale. This step shows the subtonic 7th chord of the D minor scale. The D minor chord VII7 is the C dom 7 chord, and contains the notes C, E, G, and Bb. This subtonic 7th chords root / starting note is the 7th note (or scale degree) of the D natural minor scale. The piano keyboard below contains the notes of the D natural minor scale. 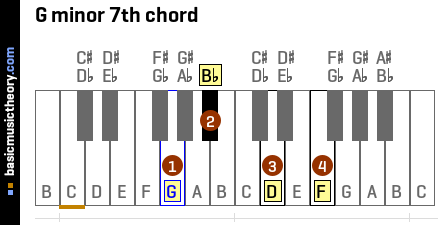 7th chords are built using the 1st, 3rd, 5th, and 7th notes of a scale, so the first 7th chord below will constructed a chord using notes D, F, A and C.
The second 7th chord below will repeat this, but this time starting on the 2nd note, so its notes will be E, G, Bb and D - ie. the 1st, 3rd, 5th and 7th positions relative to that 2nd root note. This step shows how to identify the notes and the name of a 7th chord whose root note is the 1st scale degree of the D natural minor scale. The table below shows the D natural minor scale, ordered to show the 1st note as the first column in the table. To identify the 7th chord note names, use the 1st, 3rd, 5th and 7th columns / scale degrees, which are notes D, F, A, and C.
And so the complete 7th chord Name prefixes the root note, D, onto this quality, giving us the D min 7 chord. The chord symbol i could be followed by the letter a to indicate that it is D minor 7th chord in root position (ie not inverted) - D minor scale chord ia. Instead, i could be followed by the letter b to indicate that it is D minor 7th chord in 1st inversion - D minor scale chord ib. Letter c could be used to indicate that it is D minor 7th chord in 2nd inversion - D minor scale chord ic. Finally, letter d could be used to indicate that it is D minor 7th chord in 3rd inversion - D minor scale chord id. 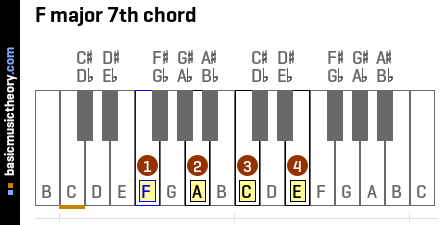 So in this key, i7 refers to the D minor 7th chord in root position. For 7th chord inversions, i65 refers to the D minor 7th chord in 1st inversion, i43 refers to the D minor 7th chord in 2nd inversion, and i2 refers to the D minor 7th chord in 3rd inversion. This step shows how to identify the notes and the name of a 7th chord whose root note is the 2nd scale degree of the D natural minor scale. The table below shows the D natural minor scale, ordered to show the 2nd note as the first column in the table. To identify the 7th chord note names, use the 1st, 3rd, 5th and 7th columns / scale degrees, which are notes E, G, Bb, and D.
Repeating this for the 5th note / scale degree, the distance between E and Bb is 6 half-tones, and the note interval name is diminished (d5). More details of this interval are at E-dim-5th. Again the 7th note / scale degree, the distance between E and D is 10 half-tones, and the note interval name is minor (m7). More details of this interval are at E-min-7th. 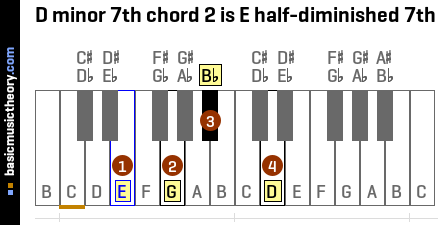 And so the complete 7th chord Name prefixes the root note, E, onto this quality, giving us the E half-dim7 chord. The chord symbol iiø could be followed by the letter a to indicate that it is E half-diminished 7th chord in root position (ie not inverted) - D minor scale chord iiøa. Instead, iiø could be followed by the letter b to indicate that it is E half-diminished 7th chord in 1st inversion - D minor scale chord iiøb. Letter c could be used to indicate that it is E half-diminished 7th chord in 2nd inversion - D minor scale chord iiøc. Finally, letter d could be used to indicate that it is E half-diminished 7th chord in 3rd inversion - D minor scale chord iiød. So in this key, iiø7 refers to the E half-diminished 7th chord in root position. For 7th chord inversions, iiø65 refers to the E half-diminished 7th chord in 1st inversion, iiø43 refers to the E half-diminished 7th chord in 2nd inversion, and iiø2 refers to the E half-diminished 7th chord in 3rd inversion. This step shows how to identify the notes and the name of a 7th chord whose root note is the 3rd scale degree of the D natural minor scale. The table below shows the D natural minor scale, ordered to show the 3rd note as the first column in the table. To identify the 7th chord note names, use the 1st, 3rd, 5th and 7th columns / scale degrees, which are notes F, A, C, and E.
For the 3rd interval (note 2 on the diagram) the distance between F and A is 4 half-tones. The note interval name for the 3rd note / scale degree is therefore major, also called M3 for short. More details of this interval are at F-maj-3rd. Again the 7th note / scale degree, the distance between F and E is 11 half-tones, and the note interval name is major (M7). More details of this interval are at F-maj-7th. 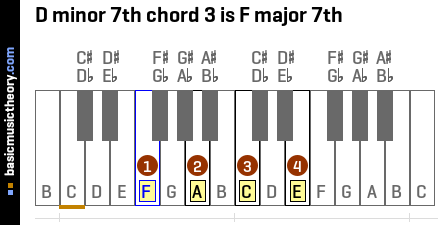 And so the complete 7th chord Name prefixes the root note, F, onto this quality, giving us the F maj 7 chord. The chord symbol III could be followed by the letter a to indicate that it is F major 7th chord in root position (ie not inverted) - D minor scale chord IIIa. Instead, III could be followed by the letter b to indicate that it is F major 7th chord in 1st inversion - D minor scale chord IIIb. Letter c could be used to indicate that it is F major 7th chord in 2nd inversion - D minor scale chord IIIc. Finally, letter d could be used to indicate that it is F major 7th chord in 3rd inversion - D minor scale chord IIId. So in this key, III7 refers to the F major 7th chord in root position. For 7th chord inversions, III65 refers to the F major 7th chord in 1st inversion, III43 refers to the F major 7th chord in 2nd inversion, and III2 refers to the F major 7th chord in 3rd inversion. This step shows how to identify the notes and the name of a 7th chord whose root note is the 4th scale degree of the D natural minor scale. The table below shows the D natural minor scale, ordered to show the 4th note as the first column in the table. The chord symbol iv could be followed by the letter a to indicate that it is G minor 7th chord in root position (ie not inverted) - D minor scale chord iva. Instead, iv could be followed by the letter b to indicate that it is G minor 7th chord in 1st inversion - D minor scale chord ivb. Letter c could be used to indicate that it is G minor 7th chord in 2nd inversion - D minor scale chord ivc. Finally, letter d could be used to indicate that it is G minor 7th chord in 3rd inversion - D minor scale chord ivd. So in this key, iv7 refers to the G minor 7th chord in root position. For 7th chord inversions, iv65 refers to the G minor 7th chord in 1st inversion, iv43 refers to the G minor 7th chord in 2nd inversion, and iv2 refers to the G minor 7th chord in 3rd inversion. This step shows how to identify the notes and the name of a 7th chord whose root note is the 5th scale degree of the D natural minor scale. 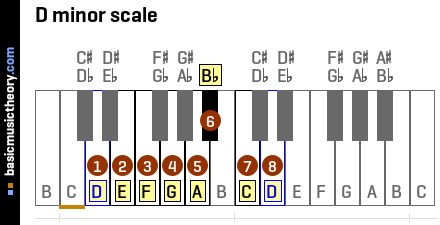 The table below shows the D natural minor scale, ordered to show the 5th note as the first column in the table. To identify the 7th chord note names, use the 1st, 3rd, 5th and 7th columns / scale degrees, which are notes A, C, E, and G.
Again the 7th note / scale degree, the distance between A and G is 10 half-tones, and the note interval name is minor (m7). More details of this interval are at A-min-7th. And so the complete 7th chord Name prefixes the root note, A, onto this quality, giving us the A min 7 chord. The chord symbol v could be followed by the letter a to indicate that it is A minor 7th chord in root position (ie not inverted) - D minor scale chord va. Instead, v could be followed by the letter b to indicate that it is A minor 7th chord in 1st inversion - D minor scale chord vb. Letter c could be used to indicate that it is A minor 7th chord in 2nd inversion - D minor scale chord vc. Finally, letter d could be used to indicate that it is A minor 7th chord in 3rd inversion - D minor scale chord vd. 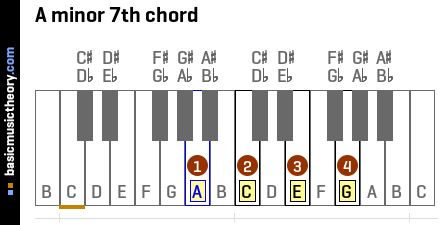 So in this key, v7 refers to the A minor 7th chord in root position. For 7th chord inversions, v65 refers to the A minor 7th chord in 1st inversion, v43 refers to the A minor 7th chord in 2nd inversion, and v2 refers to the A minor 7th chord in 3rd inversion. This step shows how to identify the notes and the name of a 7th chord whose root note is the 6th scale degree of the D natural minor scale. The table below shows the D natural minor scale, ordered to show the 6th note as the first column in the table. To identify the 7th chord note names, use the 1st, 3rd, 5th and 7th columns / scale degrees, which are notes Bb, D, F, and A. Again the 7th note / scale degree, the distance between Bb and A is 11 half-tones, and the note interval name is major (M7). More details of this interval are at Bb-maj-7th. 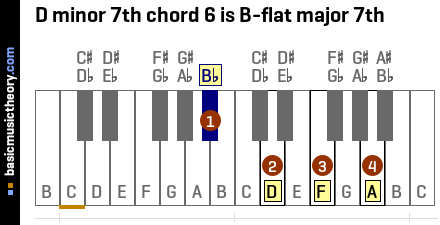 And so the complete 7th chord Name prefixes the root note, Bb, onto this quality, giving us the Bb maj 7 chord. The chord symbol VI could be followed by the letter a to indicate that it is Bb major 7th chord in root position (ie not inverted) - D minor scale chord VIa. Instead, VI could be followed by the letter b to indicate that it is Bb major 7th chord in 1st inversion - D minor scale chord VIb. Letter c could be used to indicate that it is Bb major 7th chord in 2nd inversion - D minor scale chord VIc. Finally, letter d could be used to indicate that it is Bb major 7th chord in 3rd inversion - D minor scale chord VId. So in this key, VI7 refers to the Bb major 7th chord in root position. For 7th chord inversions, VI65 refers to the Bb major 7th chord in 1st inversion, VI43 refers to the Bb major 7th chord in 2nd inversion, and VI2 refers to the Bb major 7th chord in 3rd inversion. This step shows how to identify the notes and the name of a 7th chord whose root note is the 7th scale degree of the D natural minor scale. The table below shows the D natural minor scale, ordered to show the 7th note as the first column in the table. To identify the 7th chord note names, use the 1st, 3rd, 5th and 7th columns / scale degrees, which are notes C, E, G, and Bb. And so the complete 7th chord Name prefixes the root note, C, onto this quality, giving us the C dom 7 chord. The chord symbol VII could be followed by the letter a to indicate that it is C dominant 7th chord in root position (ie not inverted) - D minor scale chord VIIa. Instead, VII could be followed by the letter b to indicate that it is C dominant 7th chord in 1st inversion - D minor scale chord VIIb. Letter c could be used to indicate that it is C dominant 7th chord in 2nd inversion - D minor scale chord VIIc. Finally, letter d could be used to indicate that it is C dominant 7th chord in 3rd inversion - D minor scale chord VIId. 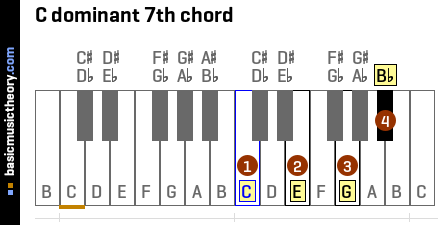 So in this key, VII7 refers to the C dominant 7th chord in root position. For 7th chord inversions, VII65 refers to the C dominant 7th chord in 1st inversion, VII43 refers to the C dominant 7th chord in 2nd inversion, and VII2 refers to the C dominant 7th chord in 3rd inversion. 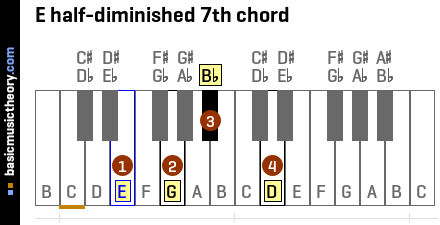 This completes the set of all 7th chords that harmonize with the D natural minor scale.